The idyllic sight of a sea otter mother nursing a pup while basking in the peaceful waters of Monterey Bay can conceal the true extent of her devotion. Lactation is one of the most demanding physiological processes that animals can experience, and for sea otter mothers the challenge can be life threatening. A new study has found that the energetic cost of rearing a pup is even higher than researchers had previously estimated. "We had been seeing a disproportionately high amount of adult female southern sea otter mortality at the end of lactation. This suggested that lactation was a particularly difficult life stage for females, but we had no idea exactly how costly it was," said biologist Nicole Thometz, a postdoctoral researcher at UC Santa Cruz working with Terrie Williams, professor of ecology and evolutionary biology. Thometz is first author of the new study, published August 3 in the Journal of Experimental Biology. 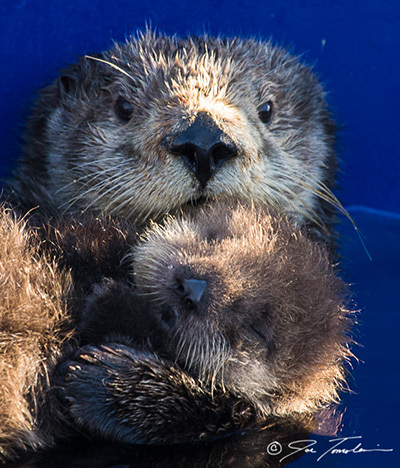 In a previous study, she used the energetics of growing sea otter pups to evaluate the cost of parenting and estimated that sea otter mothers might have to double their consumption of food to see the pup through to independence. To find out exactly how much energy it takes to raise a sea otter pup, however, the team needed to measure the resting metabolic rate of a lactating sea otter mother directly. With a moratorium on captive breeding of sea otters, there seemed little chance that they would have the opportunity. 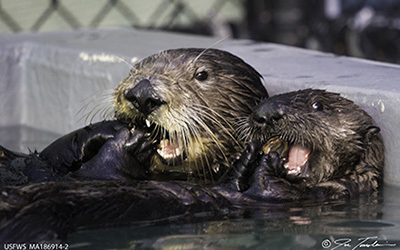 Then a pair of young sea otter females – Mollie and Clara – arrived at the Monterey Bay Aquarium. When veterinarian Mike Murray gave the animals a physical examination, he discovered that Clara was pregnant. "Mike called me to let me know what an amazing opportunity we had on our hands," Thometz recalled. The sea otters were relocated to facilities at the UC Santa Cruz Coastal Science Campus, where Williams and Thometz worked with trainers Traci Kendall and Beau Richter to collect metabolic data. They trained Mollie to enter an acrylic dome where they could record her oxygen consumption at rest. With Clara, however, they needed to minimize any changes to her natural behavior, because the team intended to return her pup to the wild. So they gently transferred her into the dome using a net, successfully repeating the maneuver when Clara was suckling her pup after the birth. Clara had caught the team off guard when she gave birth a month earlier than expected. "Beau asked one of our other trainers to take a look at Clara, and by the time the trainer got over to her, she was pulling the pup out from between her flippers," Thometz said. Comparing Mollie's and Clara's metabolism over 12 months, the team saw that Clara's resting metabolic rate at the end of the pregnancy was 16.6 percent lower than her resting metabolic rate after weaning the pup, which is similar to the metabolic rate drop seen in other pregnant marine mammals. The researchers speculate that this reduction could allow sea otters to accumulate fat reserves in preparation for milk production. After the birth of her pup and as it grew, however, Clara's daily energy demands soared, more than doubling by the time the pup was 4 months old. Meanwhile, her resting metabolic rate increased by 51 percent. "We found the cost of pup rearing to be significantly higher than previously estimated," Thometz said. "This represents a substantial energetic burden for a species with already high baseline energy demands and minimal energy reserves and is likely one of the underlying reasons why we are seeing high mortality rates for prime age females at the end of lactation." Funding for this work was provided by the Otter Cove Foundation, Monterey Bay Aquarium, National Science Foundation, and Office of Naval Research.